130 years ago today, Jupp Wiertz (Joseph Lambert Wiertz, November 5, 1888, Aachen – January 7, 1939, Berlin) was born in Aachen, Germany. Wietrz studied in Berlin and learned lithography in Leipzig. During the 1920s, he settled in Berlin and worked as an illustrator for various fashion magazines. 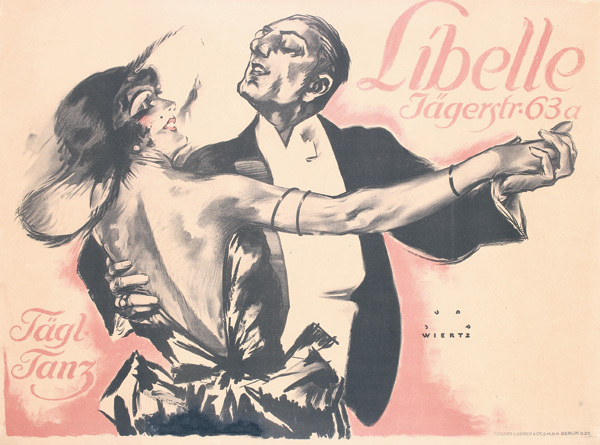 After 1925, he was drawn increasingly to poster art. His soft mannerist style was perfect for advertising fashion and tourism. He is famous for his Vogue perfume poster (ca. 1926) as well as his artwork for Deutsche Zeppelin, Lufthansa, and the German Reichsbahn.